Fifteen days. It's all we have in Thailand before we begin our volunteer program. Following a week-long orientation, we will head directly to Phnom Penh, Cambodia for three months. People spend months traveling through Thailand and we have just more than two weeks. I picked up the 375-page Lonely Planet Thailand guidebook and became immediately overwhelmed. We knew we would start in Bangkok and end in Chiang Mai for orientation, but the in betweens were daunting. In a country bigger than California (but smaller than Texas), we had no idea where to start. We eventually narrowed it down to Khao Sok National Park and then a trip to an island or a beach to see Thailand's white sand for ourselves. We are much more mountain travelers than beachcombers so the planning for a beach vacation became all consuming. Doesn't Phuket seem too touristy? Are we wasting our time trying to get to an island for just a few days? Do we really want to spend a lot of money to stay at a beach resort? We read blogs, guidebooks, asked friends and still had no good answer on where to go. Then came the most logical answer. Ask someone in Thailand. Our hosts at our Khao Sok hotel pointed us to Khao Lak and the surrounding areas. It was only an hour away from Khao Sok, a little bit off the tourist trail and would be easy to get to Phuket for a flight to Chiang Mai. 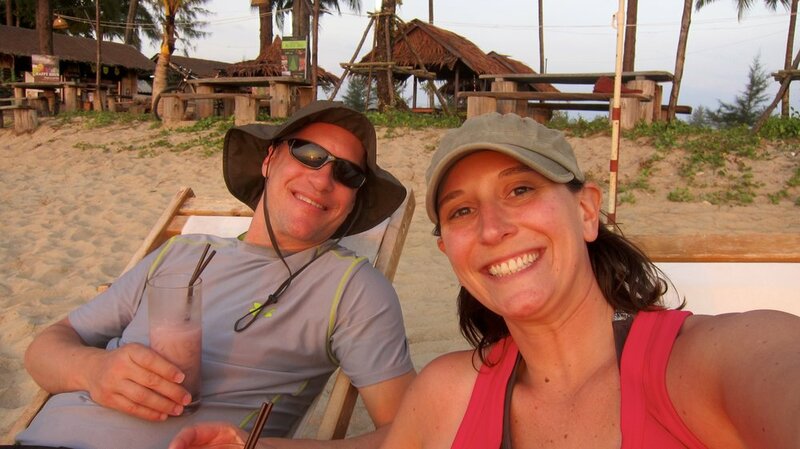 Again, planning paralysis sunk in when we Googled "Khao Lak" and saw it was also overrun with resorts and options. Luckily, our hosts had also mentioned Thai Life Homestay Resort. 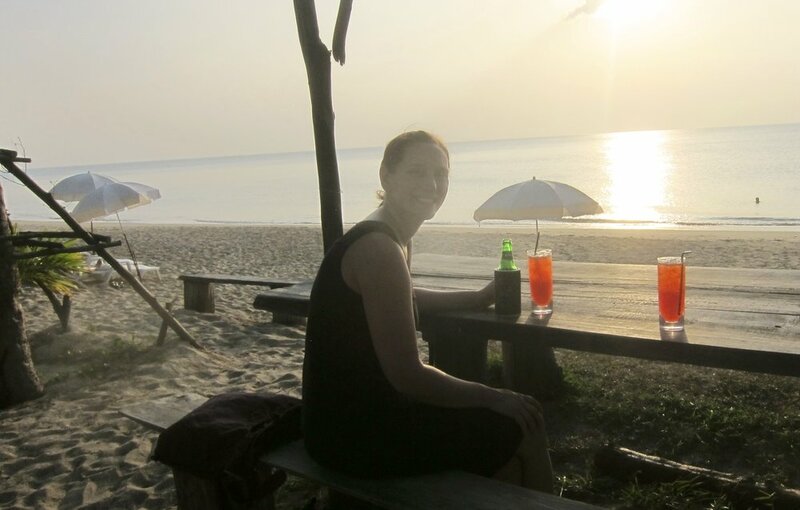 Completely away from the scene at Khao Lak, it sat by itself on a beach in Baan Nam Kem. While most of the accommodations at Thai Life Homestay were luxurious villas costing 3,500 or 4,500 baht (approximately $120 to $150), they also had four small bungalows at the bargain price of 800 baht a night ($25). Since we would get all the amenities of the resort without the costs we decided to do it. And by Thai life, we mean a tourist Thai life. There were no Thais living their life in our remote corner of paradise for four days. Our resort was incredibly beautiful with a private beach and a saltwater pool. Our bungalow, meanwhile, was far from luxurious. It had two twin beds complete with mosquito netting, a fan and not much else unless you count our roommates, hundreds of ants parading on various bamboo shoots throughout the bungalow. Surprisingly, they kept to themselves for the most part and didn't really pester us, which is more than you can say about my other roommate, whose snoring was heard in all bungalows. Oh, the bathroom was shared with the other people in the bungalows and was a couple hundred feet away from our place. Our fan worked well, the night air cooled down to where it was almost cold, mosquitos stayed out of our nets and the shared bathrooms were about 100% nicer and cleaner than the ones we have used while camping at KOAs in the States. Sunset on the beach was serene and peaceful and included happy hour at the beach bar. "Happy, happy hour!" was the call from 5:30pm until sunset each evening with 2-for-1 cocktails. Our complimentary resort bikes whisked us around the property and we enjoyed a few days of real relaxation. My favorite moments were the simplest - sitting on our porch, looking out over the lake and taking in the sounds of the fish jumping, the birds and geckos chirping and watching the ants march up and down our bamboo posts. I even got Dave to play cards with me one night. Unfortunately, for a resort, the food was lackluster so we lost a few pounds by not eating much those couple of days. Other than that, we hit the resort lottery for less than $100 for three nights. Saving money on lodging meant we would have more money to have fun. Our big splurge was a snorkeling trip to the Similan Islands off the Andaman Coast. Bargaining with our hosts setting up the trip saved us a couple hundred baht and we headed out bright and early for our boat ride, again risking our lives in the minibus that transferred us to the pier. It's "safe" to say that during each ride we've taken in Thailand there have been at least three instances where a crash appears inevitable, at least to us, but there's some kind of method to the madness of Thai drivers and we haven't seen any accidents yet. With 50 of our closest tourist friends, we boarded a speedboat headed to the islands, which are part of Thailand's National Park system. Eleven islands are included in the area. Islands 1 through 3 comprise a special conservation area, but the remainder can be either visited on land or near land. The speed boat flew through the water and our hour and a half trip led us to Island 7 for a rocky and wavy snorkeling dip in the turquoise water. It was extremely choppy, almost to where you could get seasick swimming, but we saw some amazing fish and tried our hardest to find a turtle (an unsuccessful effort). Twenty minutes and one seasick passenger later, we docked at Island 4 which is also referred to as Honeymoon Bay. We had an hour to eat lunch and explore the island and its beaches. For us this meant an hour to eat, swim, soak in the white sand and blue waters and attempt a hike to a view point while wearing no shoes. For some of the women on our tour, it meant spending an hour rolling in the waves while their friends took pictures of them with fancy DSLR cameras. It was like a train wreck - I could not look away and it just kept happening all over the beach. Our day ended with visits to two other islands, more snorkeling and beach lounging. The islands are purely breathtaking and the water is so warm it takes no getting used to. The biggest regret of the day was not applying sunscreen a few more times. We used almost a full bottle that day, but our backs, legs and Dave's head came back to the resort a little pink! After four days in the sand, we can easily confirm we are forest, mountain and tree lovers instead of beach swooners, but the chance to relax so early in our trip was really a gift. We know the next few months will be challenging during our volunteer assignments in Cambodia and we are fortunate to have had time to unwind before it begins. We'll take the "Thai Life" any day. Our final "happy, happy hour"